What is a California Eviction Notice? California Eviction Notice: What Is It? A California eviction notice is used by a landlord who needs to terminate a legally binding lease agreement between themselves and the tenant. The purpose of a California eviction notice is to either have the tenant correct a violation of the lease, known as a curable violation, or to tell the tenant they cannot correct the violation and they must leave the property, known as an incurable violation. With curable violations, tenants are given a certain number of days to correct the violation or vacate the property. All California eviction notices must comply with the state’s landlord-tenant laws. What Are the Components of a California Eviction Notice? California eviction notices are also known as a notice to quit. How many days the tenant has to correct the problem or vacate the property depends on the reason the eviction notice is issued. They may also have specific additional components. California 3-day notices to quit for non-payment of rent must comply with California Code of Civil Procedure § 3482.8. All 3-day notices to quit for curable non-compliance must comply with California Code of Civil Procedure § 1161(3). A 3-day notice to quit for incurable non-compliance informs the tenant that they have three days to vacate the property and return it to the landlord. The tenant does not get the opportunity to correct the lease violation. This type of California eviction notice is issued if the tenant is involved in an illegal activity and the landlord has proof of it. However, the landlord does not have to issue a 3-day notice to quit for incurable non-compliance if they believe it was a one-time occurrence and believes that the tenant can be a good tenant in the future. This most commonly happens if the tenant is able to convince the landlord that what they did was out of a necessity and not a reflection on their character. This sort of California eviction notice requires personal service. This means that the tenant must be served in person, including attaching it to the front door. Because these situations have the potential to be volatile, it is best if you hire a professional process server instead of taking it upon yourself to serve the tenant. This type of eviction notice must comply with California Code of Civil Procedure § 1161(4). A 30-day notice for a lease termination isn’t technically an eviction notice. However, it does inform the tenant that the landlord does not plan to renew the lease when it ends. A 30-day notice of this type is used if the tenant has resided on the property for less than one year according to California Code of Civil Procedure § 1946.1. A 60-day notice for lease termination isn’t an eviction notice. Just like a 30-day notice, it does inform the tenant that their lease will not be renewed when it ends. This particular notice is used if the tenant has lived on the property for more than one year according to California Code of Civil Procedure § 1946.1. Generally speaking, there are three ways to effect legal service on a tenant. However, which service method chosen by the landlord or property management company depends largely on the type of notice being served. 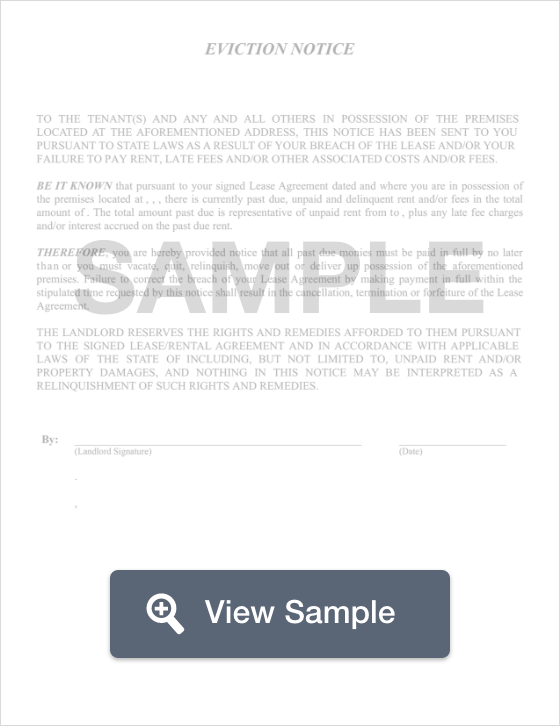 For non-payment of rent, you can serve the tenant in person, deliver the notice to someone who is a suitable age at the tenant’s residence or place of business, or you can post it in a conspicuous place, such as the front door. Your notice should include a space (known as proof of service) that explains how the notice was served and the date it was served. For curable conditions, you may choose to serve the tenant in person, deliver it to someone at the tenant’s residence or business who is of a suitable age, or you may post it in a conspicuous spot such as on the front door. For incurable conditions, the tenant must be served in person at their home or place of business. However, this can be dangerous. So, you may want to hire a professional process server. It can also be placed in an easily noticed spot, such as the front door. If you cannot personally serve the tenant, you must mail the notice via First Class Mail. If you must mail the notice, it is not considered received until one day after you mail it. What Are the Legal Considerations of a California Eviction Notice? There are several legal considerations one should keep in mind for California eviction notices. First, landlords must recognize that creating and serving the notice is the first step in the legal eviction process. A landlord cannot file a lawsuit against the tenant for eviction without first providing them with an eviction notice. If the eviction notice is mailed, the landlord must apply an extra day. For the notices themselves, the landlord must give the tenant the proper amount of notice as discussed above. Legal service is also important. If the tenant is not served in a way that is legal, they may not have to leave the property even if they’ve committed an incurable condition. Not all evictions are lawful. Illegal evictions include retaliatory evictions, locking the tenant out of the property, throwing out the tenant’s possessions, turning off the utilities, and evicting for discriminatory reasons. All landlords, regardless of what’s happened or how they feel, must abide by California’s landlord-tenant laws. Otherwise, they could be sued by the tenant. California’s landlord-tenant laws determines for what reasons a landlord may serve you with an eviction notice. The laws also state how much time the notice must give you before you must leave the premises. Some violations are known as curable. This means that you have the opportunity to fix the problem and remain on the property. Some violations are incurable violations. This means that you do not get the chance to correct the problem and that you must vacate the property by the date listed. If you receive an eviction notice (known as a notice to quit), make sure that you read it in full and understand what it is that’s happening. If you haven’t paid your rent, make sure that you get it paid by the due date. If you have questions about the eviction notice, you can reach out and contact the landlord. You can also contact a lawyer that helps tenants if you believe that the eviction notice is illegal or if there is some other problem. If the eviction is illegal, you may have grounds to file a lawsuit against the landlord or property management company. If you cannot afford a lawyer, look for a law school that hosts a legal clinic that provides help for tenants. You can also look for legal aid offices. Many offer help for California tenants. If an eviction notice isn’t legally served, a landlord or property management company may not legally remove the tenant from the property. It could also cause them to be named as a defendant in a lawsuit. The same is true if the eviction is considered illegal, as discussed in part under Legal Considerations earlier on this page. Landlords and property management companies should take the time to learn California landlord-tenant law and talk with a lawyer who works in that area to ensure that their eviction notices comply with the state and that they are protected.